Another year in the history books......wow it went by fast! 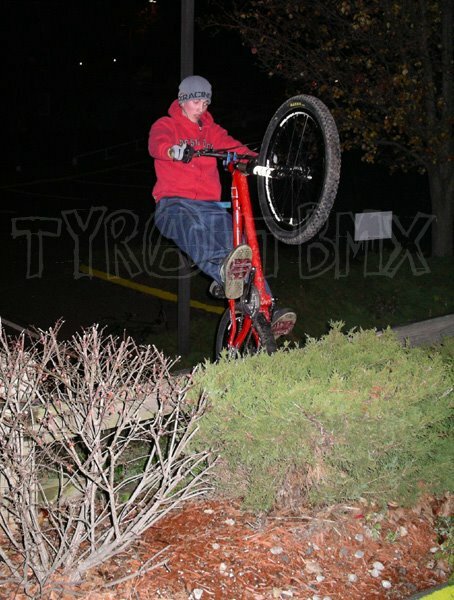 Happy New Year everyone, stay healthy and stay riding. Best of luck in 2006! 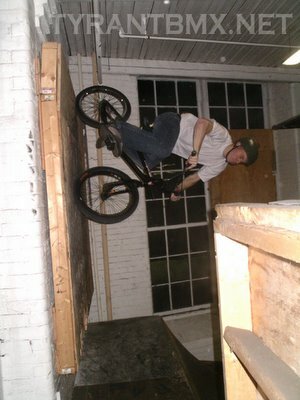 Aaron Tauscher with a HUGE Ruben wallride. Happy Holidays to everyone out there! Merry Christmas, Happy Chanukah, Happy Kwanza...or whatever you celebrate. Anyway have fun and be safe! So its been a little over a week since my surgery and I got my stiches out. 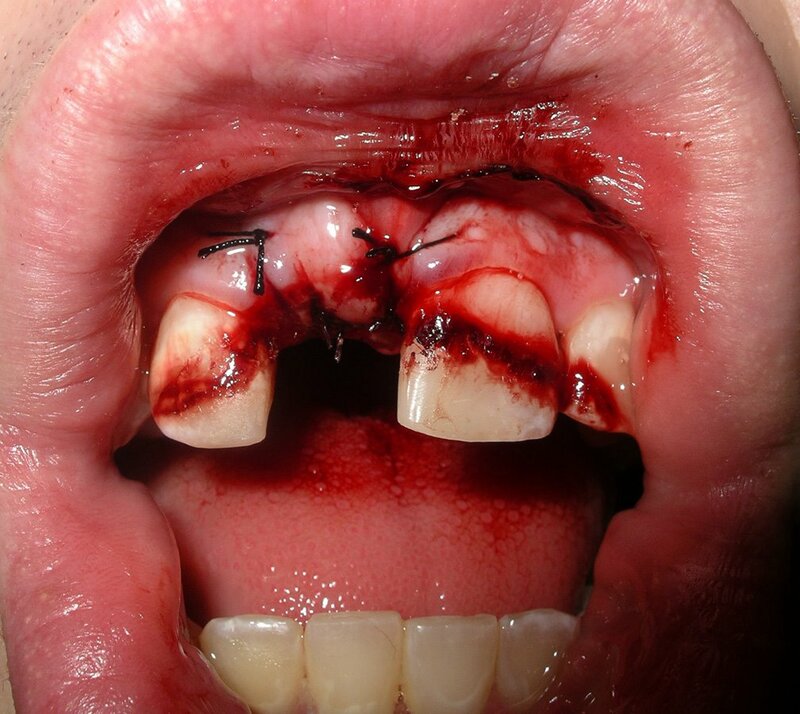 The doc said all looks well and as long as I wear the mouth guard I am cleared to ride again. So I'll be riding somewhere this week...I'm even willing to bare the bone chilling temperatures and ride some street just to get back on the bike. Up and comers in the riding world! 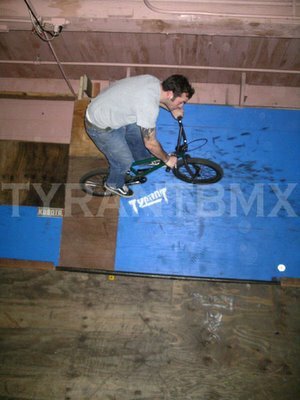 I never got around to posting a few pics of Dave Blachura from a few weekends ago. He and I hit a few parks up on a 35 degree Sunday and he was killing it as usual. Mark my words, in the years to come kids like Dave and Brandon Begin ("Tiny Tyrant") are going to be killing it at the parks, trails....anywhere they can ride. Blachura has one handed manuals dialed!!! He took this one the whole length of the box, like 18 feet! I have been working on the "Tyrant movie" for the last few years. I am constantly filming, importing clips, and editing footage. I had this grand scheme to compile tons of footage and put out an amazing, long bmx movie...but the reality of it is that I really don't have the time or the ambition to do it. I've decided to take all the footage I have and create a 1/2 hour DVD packed with solid riding featuring a bunch of local talent. I'll keep you posted here on the site, but I am shooting for a Spring premire at Pedal Power in Middletown. So Bryan Arnwine and I headed up to Burger Warehouse/Ramp Farm to ride for a few hours. As usual the locals were going off and Burger was riding at full speed, boosting, and pulling everything. Bryan hadn't ridden a skatepark in 2 weeks, but as soon as we arrived he proceeded to go nuts. 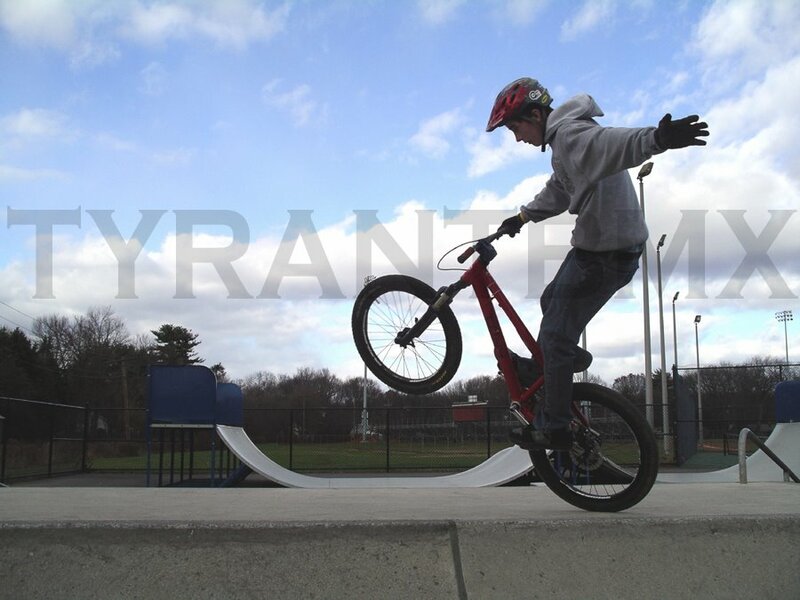 See the photos at Tyrant's Flickr. Bry went on a fufanu frenzy, pulling them on all obstacles in site. Stan "The Man" was there sporting his hessian wear and pulling some turndowns over the box. I landed a pretty decent fakie wallride and all in all we had a great 3 hour session. I'm sure we'll be back up real soon guys.....thanks! So to my suprise, I found out that Steve A. and I are both pictured in WoozyBMX.com's "Readers Photos" section thanks to everyone's favorite cameraman Matt Lolli. For those of you who don't know WoozyBMX is a rad online magazine based out of Germany. You may have seen ads for it in the Props movies or DIG Magazine. 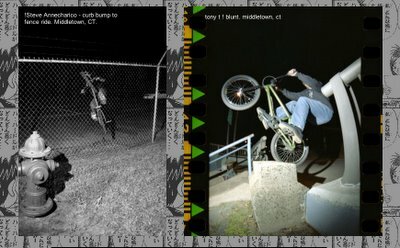 Anyway, Matt has been shooting a dozen rolls a week and apparently he submitted a couple photos to WoozyBMX and they were accepted. 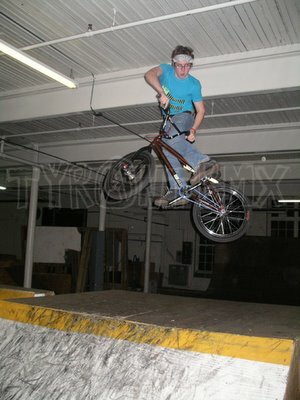 Check it out at WoozyBMX and click on the "Readers Photos" link in the middle after entering the site. I love how the Europeans call abubacas "blunts", like the skateboard term "blunt stall". Thanks Matt for shooting the photos and getting M-Town on the map. Congrats to you too for getting your photos in front of a world wide audience! Matt Lolli and I met up with mountain bikers David Blachura and Mike Stock for a late night Middletown street session. We rode for a few hours and hit a lot of new things up. Dave proved to us that he is willing to pedal 25 mph at anything and can manual from here to China. 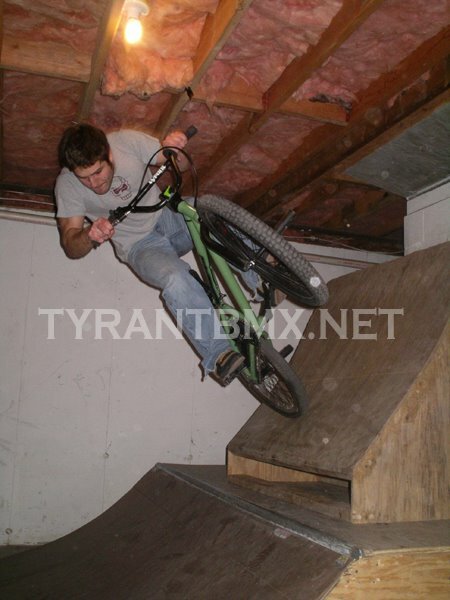 Matt is starting to get comfortable riding street on his BMX, as you can see in past photos he's obviosuly totally comfortable on it riding flatland. He busts out 15 mph mega spins. 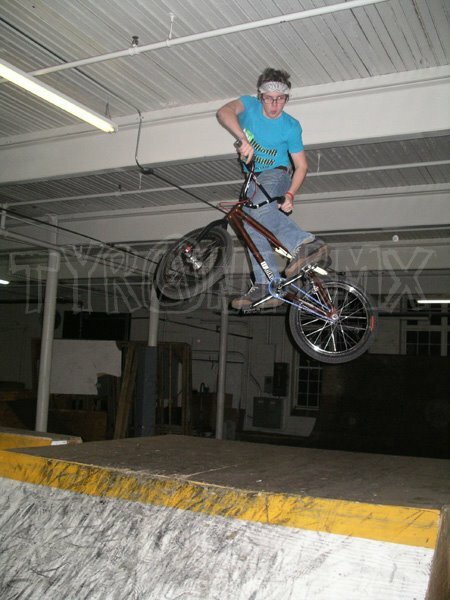 It looks like the weekend ahead is going to be a good time, hopefully I'll be headed to Skaters Edge in Taunton, MA with the mountain bike crew. Let's hope the snow steers clear of us! Tyrant's Flickr for some more photos. wet grass bank to land this abubaca.